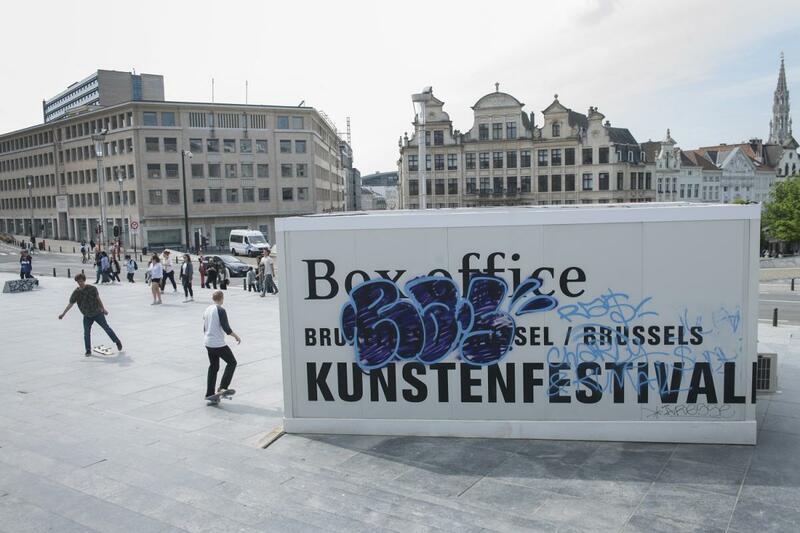 Kunstefestivaldesarts 2017 in Brussels. Photographer: Bea Borgers. Taking as my starting point the assumption that art is a social practice, and how it is made and perceived is always determined by the socio-political and economic context, I would like to propose that a festival be regarded as an art institution – and consider the implications of that perspective. The political ontology of the festival; the political and economic entanglements of curatorial practices; economic (self-)censorship and its recent manifestations at theatre festivals in Poland will be the main facets of my study. I will also enquire about how the festival today can be ‘taken over’, regained a space for critical activity. My consideration of the institutional practices of present-day festivals will be based on my own experiences as a curator; they will also be situated in the context of practicable institutional-critical activity as proposed by Gerald Raunig, and take as their point of reference the concept of an institution as a common good. The concept of the ‘performativeness of the art world’ formulated by Ana Vujanovic will be of primary importance to my study. During the Bucharest-based performative game ‘How to Make a Biennial Festival with 100 Euros and 1,000,000 Euros’,1 some participants and members of the audience reacted with dismay to my suggestion that we think of a festival as a public arts institution. How can a festival – an ephemeral, by definition temporary structure, focused on an event, usually put together and organized in the project mode, be compared with an institution characterized by a lasting, stable (not to say ossified) hierarchical order and intent on producing and consolidating artistic practices? To what end would one place two ways of producing and experiencing art alongside one another – one of which is temporary, cumulative and characterized by a certain event-like quality, while the other is based predominantly on systematic, organic work over a long time span? And what exactly would be the point of such a comparison? If we look at contemporary mechanisms of producing theatre and dance, and look at how artists work, we will see that the above descriptions of festival and art institution alike are dated. On the one hand, the terms of funding institutional theatres (who are compelled to apply for grants and additional subsidies) reinforce the project work mode and an event-based logic; while theatres beyond the repertory-based system, lacking a permanent ensemble of their own, often hinge their programme on micro-festivals (Berlin’s Hebbel am Ufer, convened by Annemie Vanackere, is a fitting example). Irrespective of their status and work structure, theatres in their institutional aspect have to cope with the demand for incessant productivity, inextricably bound up with the production mechanisms of late capitalism. The ongoing need to generate new schemes and new productions, to select new names and trends, to prepare the context – but also the need to speak out and to make their stance known, leads many institutions into the ‘hyperproductivity trap’: pointed out by scholars including Bojana Kunst2, the trap causes many institutions to lose their critical potential, leaving artists scarcely any room for experiment. This changing working dynamics of theatre as an institution often results in the precarization of working conditions, inextricably bound up with the project mode. Symptoms of precarization include work on a temporary basis, lack of stability and a long-term perspective, the need for employees to be constantly on the move between projects while ‘grabbing’ new ones, inability to focus on one task, the ongoing pressure of new ideas and forever expanding one’s network of contacts. This is true of artists and other art workers: producers, curators, those responsible for promotion, administrative and finance staff and many others. On the other hand, in the last few decades festival has gained significance as one of the most influential features of the performative-arts world. The tasks of the festival are not limited to the presentation of extant events: instead, it has become a major producer and co-producer of new work; it attracts artists; takes on the role of production promoter (both locally and abroad); provides opportunities for new projects to come into being, contributes to the emergence of the discourse concomitant with artistic practices (catalogue publications, publishing series, translations); mediates between the artist and her audience, presents the work of certain artists and recommends it to curators; finally, as it includes some artists and excludes others, the festival creates the international theatre and dance circuit. At the same time, it provides the context for artistic practice: in other words, it influences the perception of art, and delimits the ways of thinking about theatre and dance – not least the directions in which they develop. In light of the growing impact of festivals on the sphere of contemporary performative arts, I would like to propose that the festival be regarded as an arts institution. I would, moreover, like to consider the implications of this perspective. Crucially, what interests us here is a public institution: European festivals are overwhelmingly funded with public money, contributions from private sponsors being but a (usually small) supplement to the budget basis. The scope of my study will extend beyond the social, political and economic context of changes to the festival, to include an attempt to find answers to the following questions: what task and what responsibility (to artists as well as audiences) does the festival have as a public arts institution; what role does it play in forming the circuit of thought, the exchange of experiences and in shaping new artistic proposals? In my view, putting festivals into perspective alongside remaining arts institutions will enable us to recognize the role the festival has to play in shaping the contemporary system of arts production, and reveal the festival’s social and political determinants. Perhaps thinking about the festival as a public arts institution might even help us come up with a new definition of the institution? The perspective of looking at the festival proposed in the present text is grounded in the context of my practice as a researcher and curator; it is, moreover, derived from my belief that art is political (in Jacques Rancière’s understanding of the term). I take as my starting point the assumption that art is a social practice, and the ways in which it is made and perceived are always determined by the political, social and economic context. In thinking of the status and role of the festival within performative arts, I am inspired by the concept of art as a common good, proposed by Antonio Negri and Michael Hardt,4 by the outlook on arts institutions outlined by Gerald Raunig and by his proposals of the possible forms of disobedience and institutional critique.5 Ana Vujanović’s concept of the performativeness of the ‘artworld’6 remains a crucial point of reference. Institutional practices can thus be performative, and the process by which they are introduced can take place on different planes; both within existing structures and beyond them. But they are always part of a given political and economic context, always the result of a specific point of view, serving definite ends. The institution of the festival puts in place a certain way of perceiving performative arts; it defines individual trends and sets the course for the development of theatre and dance; it arranges artworks in a certain order; establishes artist hierarchy and determines the requirements and criteria for producing new shows. Being featured in a festival programme is a definite boost to an artist’s standing: her work is exposed to a wider, often international, circle of curators, which may lead to subsequent invitations and offers of producing new shows. Showing a production in a certain context, to an audience attached to a specific location, in conjunction with a selection of other productions and (frequently, though not always) set against a theme or motto specified by curators, has a strong impact on how a given production will be interpreted and received, and thus may determine the artist’s career path. It is difficult to overestimate the role of festivals on the performative-arts circuit: especially in dance, where adequate infrastructural support has yet to be found. Given the insufficient numbers of dance houses and choreography centres, for many choreographers the festival is the main opportunity to present their work and meet their audiences. RAISING OF CONFLICTS, by Boris Charmatz, creation date: 2010. Photographer: Christophe Raynaud de Lage/Festival d'Avignon. As festivals collaborate on a production, they work alongside the artist on choosing its idiom and subject matter, they invite the artist to take up residency in the festival city and communicate with audiences and other festivals (collaboration on production descriptions, work on festival events other than the shows themselves, acting as mediators in liaising with audiences and the media). The festival thus takes responsibility for the practices of individual artists, for the way their work is perceived, and for the form taken by a given art field. What is more, the festival is invariably a political institution, by virtue of its very presence in the public sphere whose structure it either reflects or shapes, by creating or changing perceptions, and, finally, by virtue of its impact on establishing artistic and social relations and practices. After all, the very act of selection, and deciding how productions are shown, is in itself a political gesture – as is the shaping of context or formulating the festival message in conjunction with the audience. Meanwhile, when it comes to festivals, the category of choice is key. For one thing, the choice of a given artist may determine her subsequent career path: the fact that her work is shown at a festival is a form of recognition and legitimization of her artistic practice. When, during subsequent editions of the Theatre Confrontations festival in Lublin, I work with Grzegorz Reske on the programme, we are consistent in showing the work of a specific artist; we support her in her practice, and at the same time boost her growth opportunities and strengthen her standing in the world of theatre, both locally and globally. Meanwhile, others are left behind. If, during the four past editions, we have sought out productions put together as part of a collective, outside the structures of repertory-based theatres; or productions that take these structures as their theme, calling them into question – we have consciously worked towards supporting a specific system of theatre production and a specific way of thinking about theatre. Thus we establish – if only for the duration of the festival – a certain order in the sphere of performative arts, we propose a specific perception of contemporary theatre or dance; we endeavour to offer instruments which, in our view, will make that perception easier to name and grasp. In other words, we institutionalize selected phenomena. Secondly, a curator’s choice is linked to predispositions that are personal indeed and can at times be affective, as relations between artists and curators often morph into personal relationships. Striking a balance is key – at the same time, we know very well that the late capitalist system of art production makes it impossible to distinguish between personal and professional life: our subjectivity and personality, our choices, emotions and decision are our basic capital. It is no accident that curators began to emerge as a profession in the late 1960s and early 1970s (a decade later in performative arts), just as the work model was evolving into post-Fordism. A curator’s work relies on generating communication, production of knowledge, creating network-like structures for the exchange of information. A curator operates in a network rather than a hierarchical system; what matters here is being constantly available and in standby mode, being open to new ideas and contacts, as new projects spring from these ideas and contacts. The ability to make as many contacts as possible (whilst carefully choosing the most valuable of these); the skill of fishing for information and an intuitive sense of the direction a given course of action is likely to take; being constantly engaged (impeccable qualifications are not enough, unreserved personal involvement and passion are fundamental); enthusiasm, mobility, but also the ability to convey one’s autonomy and defend the choices one has made; knowledge in a given field, which enables one to take the position of an expert consultant – all that comprises a catalogue of a late capitalist worker’s essential features. Cognitive capitalism relies largely on non-material production, based above all on the production of knowledge, on generating communication, creating network and relocating – and the entire contemporary festival industry is a perfect embodiment of this production system. The choices made by those responsible for festival programmes are not ‘innocent’ or neutral: quite on the contrary, they remain embroiled in the social and political context. Curators’ choices often depend on the local context (the work of a given artist will have a different meaning when shown in Lublin, another in Kiev, still another in Bochum: in each of these locations, audiences, artists’ circles, needs and interests are all different). In each instance, whether a project comes to fruition and is successful depends on careful insight into the local environment and its needs. Grant-awarding bodies and their preferred (at times imposed) thematic fields and areas of activity remain an equally strong determinant (disabled people can be in the spotlight of stage patronage on one occasion, only to be completely marginalized by set grant programmes on another; Moldova, Ukraine, Georgia, Belarus and other countries of the so-called Eastern Partnership, a Polish-led EU initiative governing the EU’s relationship with post-Soviet states, have for years been the focus of government attention in Poland – only to cede their priority status to other geopolitical areas in the twinkling of an eye). There is little doubt festivals for whom their discursive task is a major consideration, can play a significant role in identifying, naming and posing as problems, new trends in theatre and dance – while providing them with legitimization and an institutional background. However, we need to bear in mind that the choice of a given current is never universal and legitimate of itself: after all, outlining the scope of a given sphere invariably entails leaving some areas beyond the freshly outlined borders. When we made the decision that the programme of the twenty-first edition of Theatre Confrontations would focus on a new current in Polish theatre, which Joanna Krakowska called ‘auto-theatre’, we were well aware that our gesture of outlining the sphere of auto-theatre may be as risk-ridden as it is worthwhile. This is because we were working from the outside, imposing on artists the discursive framework for their own artistic practice: one with which, after all, they need not agree. What is more, naming a given phenomenon is, on the one hand, significant as far as the development of discourse surrounding artistic practice is concerned – but on the other, entails the risk of creating a new trend, not to say a new brand: an enticingly packaged product one can place on a shelf alongside other phenomena, relieved to have it named and put in order. These other phenomena are recognized, put into words and catalogued, the easier to circulate further. Thus the point here is not so much that the festival has been instrumentalized. Bitef was obviously serving specific political ends – but, as we have seen, every festival does just that: at a local as well as international level, with regard to artists, municipal authorities, audiences and residents. A festival’s political nature stems from its very presence in the space that is society, where various relationships, conflicts and group interests intersect. However, this does not mean that festivals should be reduced to the role of political instruments. What is evident from their history and status is that festivals, being structural components of the artworld, are conditioned by a variety of social, political and economic contexts; and it would be extremely difficult to assess them without taking this inherent feature into account. Looking at the festival as a public art institution may prove useful for yet another reason: it provides an opportunity to put debates concerning the acts of censorship (economic censorship included) or self-censorship we can observe in the festival context into a new perspective. Poland, for its part, has had no shortage of censoring interventions in recent years. Examples that spring to mind include the attempt to cut funding for the EEPAP [East European Performing Art Program] project for showing Low Pieces byXavier Le Roy during the 2013 Theatre Confrontations festival; the cancellation of Rodrigo Garcia’s Golgota Picnic at the 2014 Malta Festival; cancelling the opening night of Karol Tymiński’s production during the Body / Mind festival in autumn 2015; prosecution proceedings in relation to Naše nasilje i vaše nasilje [Our Violence and Your Violence] by Oliver Frljić – a production ostensibly offensive to religious sentiments and to the Polish nation – being shown during the 2016 Festival of New Dramaturgies at the Polski Theatre in Bydgoszcz. Each of these instances points us towards fundamental questions: who owns public theatre? Who does art belong to? For whom is it made? Who is included in the concept of society or nation: which social groups are reinforced as part of that concept, and who is excluded? ‘To spend our money on such things!’ – the indignant rallying cry keeps recurring like a mantra. Indeed: who is entitled, by the public institution, to determine what is and what is not art; and where does art have its limit? After Our Violence and Your Violence had been shown at the Festival of New Dramaturgies, a group of protesters gathered in front of the theatre where the event was held. They carried a banner reading: ‘Who let you in here, theatre instigators?’. In my view, this slogan hits the spot when it comes to revealing the nature of the dispute about contemporary public theatre and related institutions – festivals included. Who do the institutions actually belong to? And who determines that? The public sphere, potential critical spaces and opportunities are all shrinking before our eyes as places capable of playing that role are subjected to commercialization, the requirements of the market and capitalist production, as well as management control – measures imported to state institutions directly from the corporate world. This is precisely why every action and every decision taken at a public institution is politically significant. In my view, a festival organizer’s decision to cancel a show is not only an act of economic (self-)censorship but, above all, an act aimed against the very principle on which a public art institution operates. Considered in the context of the present social and economic circumstances of producing art, the cancellation of Golgota Picnic demonstrates yet again that being aware of the political nature of a public art institution is requisite for that institution to operate. If we look at how festivals have developed, we can identify two points in time that have added to their significance in the last twenty years. The first of these is the opening of borders in Eastern Europe post-1989, which has greatly increased and facilitated artist, curator and producer mobility within the continent; parallel to that, festival numbers increased rapidly in the 1990s. In the other significant development, the role of festivals shifted from presentation to production. I believe the rapid growth of the festival scene in the period of interest here is closely linked to the social and economic context determining the mechanisms of art production; it is the result of social, political and economic changes discernible in so-called Western Europe roughly from the 1980s, and in post-communist countries from the 1990s. What I mean specifically is the transformation of the industrial model of capitalism into a cognitive one, based on knowledge, mobility and communication. In the Polish system of theatre production, festivals have become one of the emblems of the new economic system: the explosion of festivals in the 1990s and in the earliest years of the twenty-first century has resulted in a situation where there is at least one festival for each day of the year. The implications of the development of the festival model have been manifest and acute indeed: artists’ working conditions have become precarious; artistic practice, stretched between one project and the next, lacks continuity, focusing instead on the result and the end product. Mobility and flexibility are vital in this model, as is the constant readiness to move from place to place and from job to job; the ability to establish contacts and weave one’s own network of interdependencies and influence (searching for collaborators, residencies and funds, building a network of relations with curators and those responsible for festival selection, etc.). On the festival art circuit, and in the festival art-production model, the task of artists is to provide curators with ready-to-sell products, assessed according to their varying prestige. If we look at the festival from that point of view, we will see that not only is it, to a large extent, the product of the neoliberal system, but it also reinforces and consolidates the neoliberal order. An urgent question presents itself here: how, given how strongly they are embroiled in neoliberal mechanisms, can festivals meet the basic criteria of a public art institution? And another one: given these circumstances, is it possible to think of a festival as a critical, emancipatory proposal? If so, how can that potential be unlocked? In my view, one of the ways of ‘taking the festival over’ would be to refuse to uphold the framework within which it has operated so far, and take the risk of setting up a new framework. Acting on the implications of thinking about the festival as an art institution entails not only a fight for the festival as a communal space, but also the need to tackle the institutional entanglements and burdens I have mentioned. To take the festival back would thus mean: to reveal and seize the working and art production conditions in which a festival operates (and which a festival itself produces); to name the context in which art comes into being, and to be open to new, as yet unrecognized solutions. I envisage such a festival as regained public space, a communal arena that becomes a place of searching for forms in which multiplicity can function. As a place that not only provides artists with opportunities to work and develop their practice; stimulating the exchange of thoughts and experiences as it gives artists a chance to engage in a free debate, unburdened by hierarchy – but it also radically counters one of the basic features of a festival, its event-like nature, and offers the opportunity to work on new ideas without expecting in exchange a finished product: a production that will exceed its predecessors when it comes to quality and sales. A festival of this kind would provide artists with stable working conditions, it would take risks, open itself to the process of experimentation; enable work on different themes and formats, and propose new ones. In other words, it would be opting for what Gerald Raunig has identified as a progressive form of institutional critique: the point of this proposal would be to seize the political potential of the festival and transform its practices from institutional to instituting – ones that would attempt to establish a new order and create a new working mode. The point would be to administer an exodus21 of the institution in the form it has had so far, and reinvent it. Turn, Turtle! Reenacting The Institute, eds. Elke van Campenhout, Lilia Mestre (Berlin: Alexander Verlag, 2016). Institutional Attitudes: Instituting Art in a Flat World, ed. Pascal Gielen (Amsterdam: Valiz, 2013). 1. Ivana Vaseva and Biljana Tanurovska-Kjulavkovski, ‘How to Make a Biennial Festival with 100 Euros and 1,000,000 Euros’, performative game organized as part of the RE//Dance – the Regional Choreography Biennale, in Bucharest (1–6 November 2016). 2. Bojana Kunst, Artist at Work: Proximity of Art and Capitalism (Alresford: Zero Books, 2015). 3. New York City is a good example: apart from Under the Radar and COIL, the two renowned festivals that every January are concomitant with the APAP/ NYC conference and fair (Global Performing Arts Conference and Marketplace, organized by the US-based Association of Performing Arts Presenters network), at least three new major festivals of performative arts have come into being in recent years. American Realness, Prototype and a showcase of New York’s dance artists organized by New York Live Arts, are also held in January. Nonetheless, the APAP conference and fair still set the dates and the framework for the remaining events. 4. Antonio Negri, Michael Hardt, Commonwealth (Cambridge: Belknap Press of Harvard University Press, 2009). 5. Art and Contemporary Critical Practice: Reinventing Institutional Critique, eds. Gerald Raunig, Gene Ray (London: MayFlyBooks, 2009). 6. Ana Vujanović, ‘The Magic of Artworlds (Three Scenes from Belgrade)’, Performance Research, 20.4 (August 2015), pp. 30–38. 7. Gerald Raunig, ‘Instituent Practices, No. 2: Institutional Critique, Constituent Power, and the Persistence of Instituting’, trans. Aileen Derieg, in Art and Contemporary Critical Practice, p. 176. 8. Raunig, ‘Instituent Practices, No. 2’, p. 176. 9. See Vujanović, ‘The Magic of Artworlds’. 10. See Rabih Mroué, ‘At Least One-third of the Subject’, Frakcija Performing Arts Journal: Curating Performing Arts, 55 (2010), pp. 86–89 (p. 88). 11. Tea Tupajić, Petra Zanki, The Curator’s Piece: A Trial Against Art, 18.konfrontacje.pl/en [accessed on 10 July 2017]. 12. www.festwochen.at/en [accessed on 30 November 2016]. 13. Dragan Klaić, Festivals in Focus (Budapest: The Budapest Cultural Observatory, 2014), p. 20. 14. Vujanović, ‘The Magic of Artworlds”, p. 35. 15. Vujanović, ‘The Magic of Artworlds’, p. 36. 16. Vujanović, ‘The Magic of Artworlds’, p. 36. 17. Vujanović, ‘The Magic of Artworlds’, p. 36. 18. See Agata Adamiecka-Sitek, Iwona Kurz, ‘Democracy: Do It Yourself’, Polish Theatre Journal 2 (2016) [accessed on 14 July 2017]; Antoni Michnik, ‘Golgota Picnic and the Framework of Public Discourse: Performing Democracy and Managing Social Indignation’, Polish Theatre Journal, 2 (2016) [accessed on 14 July 2017]. 19. Censoring Culture: Contemporary Threats to Free Expression, eds. Robert Atkins, Svetlana Mintcheva (New York: New Press, 2006). 20. Dragan Klaic, Resetting the Stage: Public Theatre Between the Market and Democracy (Bristol, Chicago: Intellect, 2013), p. 138. 21. Raunig, ‘Instituent Practices’, No. 2.